The best way to fully enjoy the rocky coasts full of bays, coves, and caves is surely the tour of the island via sea. 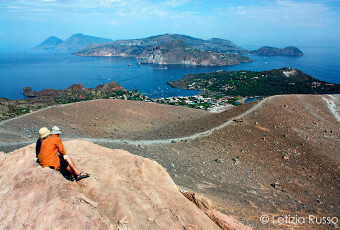 The whole Aeolian coastal area has landscapes of an extraordinary beauty and uniqueness, but the sea of Panarea stands out for the presence of these islands: Basiluzzo, Bottaro, Dattilo, Lisca Bianca and Lisca Nera which, together with the island form a stand-alone archipelago situated upon the unique volcanic complex. The Panarea coasts, beyond being the demonstration of the powerful volcanic nature of the place, collect in a short stretch of sea several peculiarities which transform the discover of this small archipelago between Lipari and Stromboli into a continuous emotion, which vary from one island to another. Moving from the port in the southern direction, after having surpassed the promontory of Peppemaria and the village of Saint Pietro, you arrive to Drautto where the characteristic village is situated, extending along the coastal line. The Torrione Point, situated in front of Contrada Drautto divides from the Caletta di Zimmari a very beautiful half-moon shaped beach, mostly visited in August. The next stretch is that of the promontory Milazzese, rising with steep perpendicular walls upon the sea, where the ruins of the old prehistoric village arise. On the southern side of Milazzese Point a rocky coast forms a natural pool called Cala Junco, which according to many, represents the most beautiful and suggestive glimpse of the island. This point is perfect for diving into the wonderful waters of turquoise, indigo and intense blue colours. From the frontal beach an ancient path leads to Milazzese Point where you can admire the ruins of the 23 hubs of oval shape and one of quadrangular shape dating back to the Bronze Era. After the refreshing bath of Cala Junco go on towards the western side introduced by the rocky coast which tends to bitter the further you approach the western side. From the sea you understand that the island has two faces: the first one, corresponding to the village, is shaped by slight slopes which gradually go down towards the sea leaving space to plains and wonderful beaches; the second one, on the contrary, is harsh and wild full of gullies and undercoastal slopes which make it impossible to moor.